Sometimes we have heard the Christmas story so often it has lost its impact on us. The Christmas season can have us so busy and tired that we don’t have time to think deeply about the things Mary thought about. I picture Mary looking at sweet little Jesus as she holds Him in her arms and thinking to herself this is God in the flesh. She’s just a young girl, and she has just given birth to the Messiah – the Savior of the world. I think sometimes in our Christian walk when we first meet the Lord, when He saves us, we are in awe and as times goes on in our walk we can sometimes just get lost in the busyness and mundaneness of life and really not take the time to meditate on God’s Word and the realities of who Jesus is and what He has done for us. The Christmas season can be a time – a reminder to us to refocus – to again think deeply about the realities of who Jesus is and what He has done for us. God’s Word is alive – it’s true – I want to continually know and grow more in my love and knowledge of who the Lord is and truly ponder deeply on those things, so they take root and bring about change in my walk with Him. That they grow me more in my love for Him and through that in my love for others – starting within the four walls of my own home. Every Christmas season I look forward to reading the account of the birth of Christ in Luke together as a family on Christmas morning. I'm amazed at Mary's faith. What must have gone through her mind when Gabriel approached her? How did she process the news that she and Joseph were to raise the Son of God? What depths of sorrow did she endure while watching her Son die a horrific death on a cross? 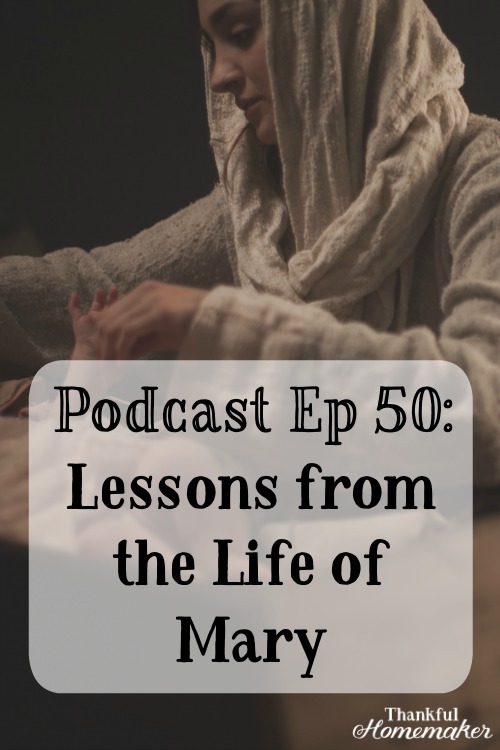 There are many lessons we can learn from Mary’s life, but I want to share just ten today. John MacArthur in his study bible shares on this verse: – Mary was in an extremely embarrassing and difficult position. Betrothed to Joseph, she faced the stigma of unwed motherhood. Joseph would obviously have known that the child was not his. She knew she would be accused of adultery—an offense punishable by stoning (Dt 22:13–21; cf. Jn 8:3–5). Yet she willingly and graciously submitted to the will of God. Spurgeon on pondering them in her heart – (Mary) Weighed them, estimated them at their right value. Mary laid these things up in store, and pondered them, giving them their due weight and value. Oh, that we did the same with every truth that we learn! The best of coffers to lay up anything in is the heart. Happy are those who, like Mary, store up the things of Christ, not in their brain though that would make them orthodox; but in their heart, for that will bring them salvation.